Buying golf shoes is never quite a straightforward process, and nor should it be. After all, you’re going to be spending anything from three to five hours on your feet – even though it might not feel like it at the time – so comfort is the number one consideration upon your checklist. Then, and especially in the UK, you want them to be waterproof for the full duration. And, of course, they’ve got to look good. It’s a big ask for any sportswear manufacturer but, as we all know, Adidas aren’t just any sportswear manufacturer – they’re arguably the very best. I play football regularly and have always loved the Adidas World Cup boot. For casual wear, I’m hardly ever out of a pair of their Roms, Samba or Gazelles, so when I was asked to test the 360 ATV I couldn’t wait. The thing with Adidas is, you know they’re going to look good, so there’s one box ticked off straightaway. I just loved the white/orange pair that I was asked to test. But for me the biggest thing as a golfer is that first round – something to be dreaded in new golf shoes with the prospect of blisters on heels and toes – notwithstanding a ready supply of plasters and fresh socks – and a last few holes walked with a limp and a disappointing score. So taking these babies on a press trip to Colombia felt like inviting trouble. Five rounds of golf at altitude; having to walk all the courses as there are no carts in Bogota or Medellîn; knowing the rounds were going to be at least four hours; it all added up to a big risk. Believe me, I did have the BandAid at the ready! But golfers of the world should unite in praise because the boys and girls at Adidas have pulled it off, and then some. These are golf shoes that you can pull out of the box, play a four-and-a-half hour round at altitude, walking up the 18th fairway with a couple of birdies under your belt and a putt for another one – and not a limp or spot of blood in sight. They were comfortable from the start and I could actually feel the assistance that technology was providing in both comfort and support for my feet during the golf swing. And when I wanted to let rip, my feet slipping from under me through the hitting area wasn’t a concern: I knew the shoe was going to do its job and give me that solid base needed at that crucial moment. Adi Dassler, you can be proud of the people who work for you and uphold the Adidas traditions. 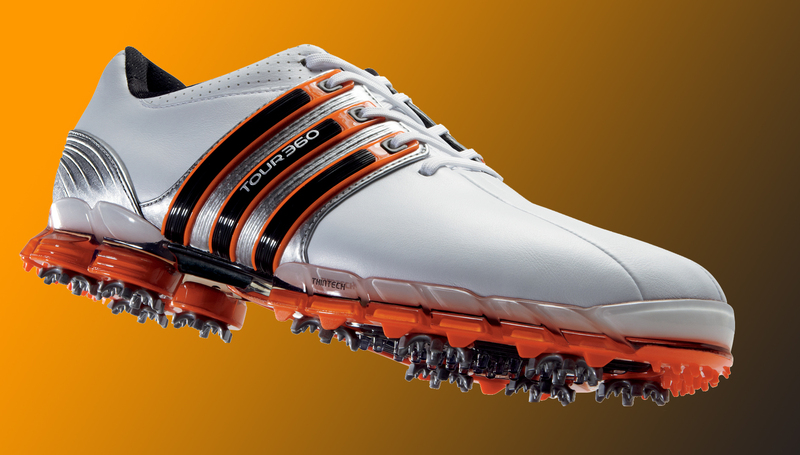 Truly we have a golf shoe that ticks all the boxes. As you can imagine Adidas have brought in a whole host of innovative concepts to make the 360 one of the best golf shoes on the market. THiNTech is a low-profile outer sole that helps with your stability, and CLIMAPROOF makes the shoe 100% waterproof with two layers – the second taking the moisture created by the foot inside the shoe and moving it to the shoe’s surface, leaving your feet dry and comfortable. FitFOAM is a moulded polyurethane inner sole which supports your foot from heel to toe while enhancing your comfort and balance. 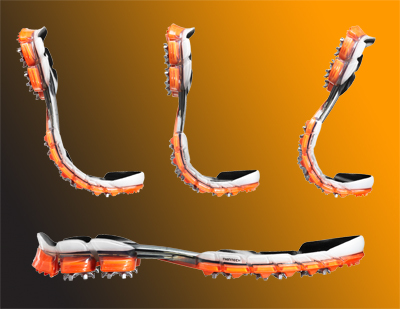 TRAXION is the high-traction outer sole that provides maximum grip to help prevent your feet slipping on various types of ground surfaces. You’ll love this shoe, it has everything: looks and style, water-resistance, comfort and improved stability, so you can be sure your feet won’t slip from underneath you as you’re going for that big drive. But the very best thing in my book? It’s a shoe you can wear on your first round and not have to worry about blood and pain! Relax, enjoy, and go for it.